It seems like a lifetime ago that I first began to write to you about the garden's progress. Little sprouts peeking through the soil in rows, everything lined up just so. After harvesting carrots and shallots, we combined two beds and have already re-planted them with winter greens. The garden has already given us so much, I don't know where to start. I guess I could tell you where to start. Start here. Start now. Start to think about what you would like in next years vegetable garden now. Why not take advantage of the energy surge that comes with these first days of autumn by ordering your seed catalogs? Get the paper kind, at least this first year. They're good to have around. Our experience has been that many catalogs, in addition to supplying us with seeds for heirloom varieties we don't normally find at the nursery, also provide useful information about planting schedules, preferred types of soil, companion planting, and ways to keep them healthy. I found myself referring to my seed catalogs just as often as the books we'd checked out of the library. Familiarizing yourself with how things grow and thinking about placement now will just make things easier when you start digging next Spring. 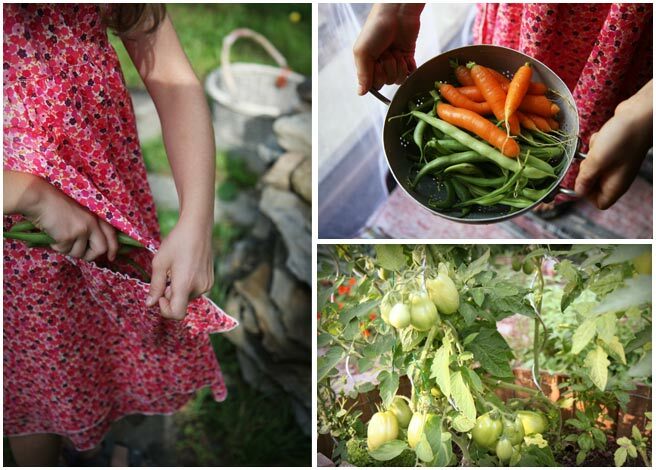 This summer, especially now that things are ripening, I am so thankful for the spark of inspiration that gave way to our potager, our vegetable garden. Last spring, when our plants were nothing but seedlings grown on our city window sill, I wrote to my friend Lizbth, asking her what vegetables her children liked. They were coming to visit this summer, and I figured I could plant them and they'd be ready just in time for their visit in August. The only thing she could definitely say about that was that they both had a thing for carrots. So we planted them. The carrots grew in neat little rows. Only later did I realize what a miracle this was, in my conversations with the two experienced gardeners in the village. "Carrots don't grow here", they said. But our little raised bed into which we layered loose worked native soil and haphazardly folded a good dose of our rich black compost before planting somehow coaxed them out. The wild boars didn't come digging either, which was a blessing in itself. When Lizbth's children came, I gave them free rein in the carrot patch throughout their stay, sending them out with baskets and gloves. Such rich pickings, and all for just a very little bit of work and care. They came back with marvelous harvests, mostly to be crunched down straight after washing. Have you ever soaked up the pure joy that emanates from a little girl perched on a stool at the kitchen sink, washing the carrots she just picked and placing them neatly in a colander? Have you ever let the perfume and sweetness wash over your senses while crunching a freshly pulled carrot? We made a carrot cake, too. There's more to say about the garden. But I am in the city now, and there are new restaurants to try, calls to make, and errands to run. It's September in Lyon! Oh Lucy...yet another magic post. I had my first vegetable garden this year and am on the same page- time to start saying goodbye to my eggplants and tomatoes and hello to kale, arugula and collards. I can't help but be excited on the cusp of my favorite season. I'm guessing autumn is gorgeous in Lyon like it is in Chicago. What a lovely way to start the day! Your garden companions make the days so very precious, and their help is better than riches. We're experiencing September, as well, with the sun-dapple from the open door flashing dips and dabs down the stairs, and the scent of coming Fall in the air. This piece SO reminded me of our youngest, when we were first married and he was about six---we'd planted a tiny garden out in back of our little rental house, and on his Spring visit, he was so fascinated by the radishes---the thrill of the hunt and the exhilaration of the find, that he couldn't wait to get out there in the morning and pull up the ones grown big enough in the night. We had them standing in glasses and goblets in the refrigerator, great green-topped bouquets of them, staying fresh and crisp, for days. What a lovely memory, and what a lovely reminder. Have you done posts on the food wonders of Lyon? I'm visiting in October and want to find the best food spots to visit while there. Your garden is so lush! Do you have an irrigation system? How often do you visit it? My own little garden contains tomatoes, lettuces, and herbs, and I would SO love it to look more like yours! Hey Janet, It's been cool and particularly rainy this summer. We watered by hand (we don't have a hose yet) in the mornings and evenings on days it didn't rain, during the summer vacation. 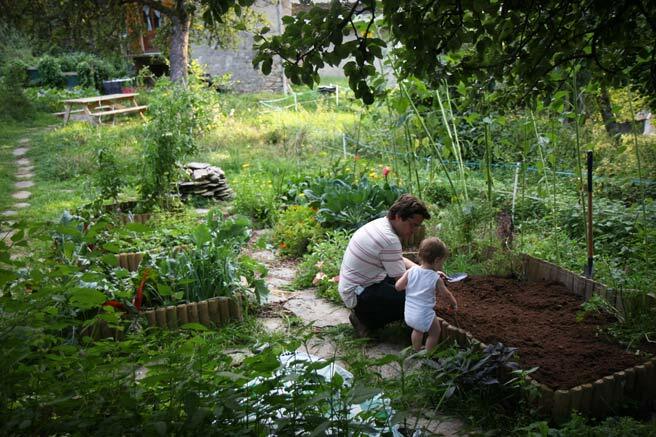 We did a lot of hoping at the beginning when the seedlings were on their own and we were in the city. A neighbor came and watered a couple of times in June. We chose the container method because it keeps things moist and also warmer at the beginning of the season. We definitely don't have the same yield as people who planted in rows, but enough for us to eat weekends and take some back to the city with us now. How lovely! It shames my wasted garden this year (had too many other things going on, and the weeds took over). And how funny that you have to worry about wild boar. Little carrots , eaten raw , are better than sweets ! Thanks so much for stopping by my blog... yours has been a favorite of mine for many years (and I've found so many fab things here!) talk about a dream place to live! Here's to a super harvest in your lovely garden! Amazing photos and great post! I love this blog - you fill it with great ideas. 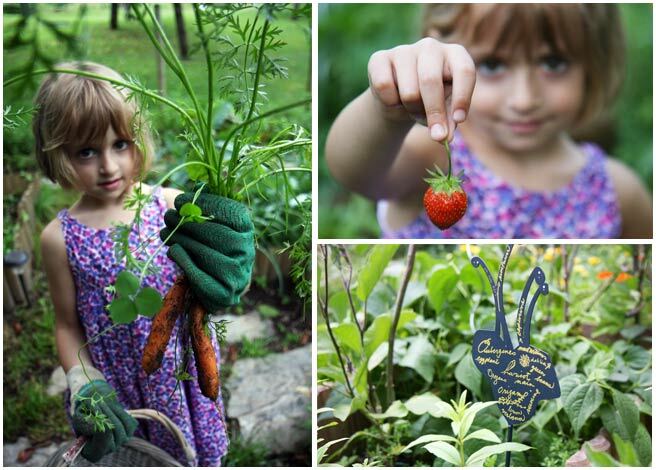 Those photos are so sweet, especially the one where she's holding the strawberry! I just came across your blog, and I just wanted to say that it's lovely. The photography is wonderful. somehow I always feel like I'm into spring this time of year...at least where tha garden is concerned...just want to fiddle and plan and replant and change.. such beautiful photos of your potager and the pretty demoiselle in her flower dresses...makes you want to get out there and start anew on your potager...enjoy! I'm ordering the seed catalogs!